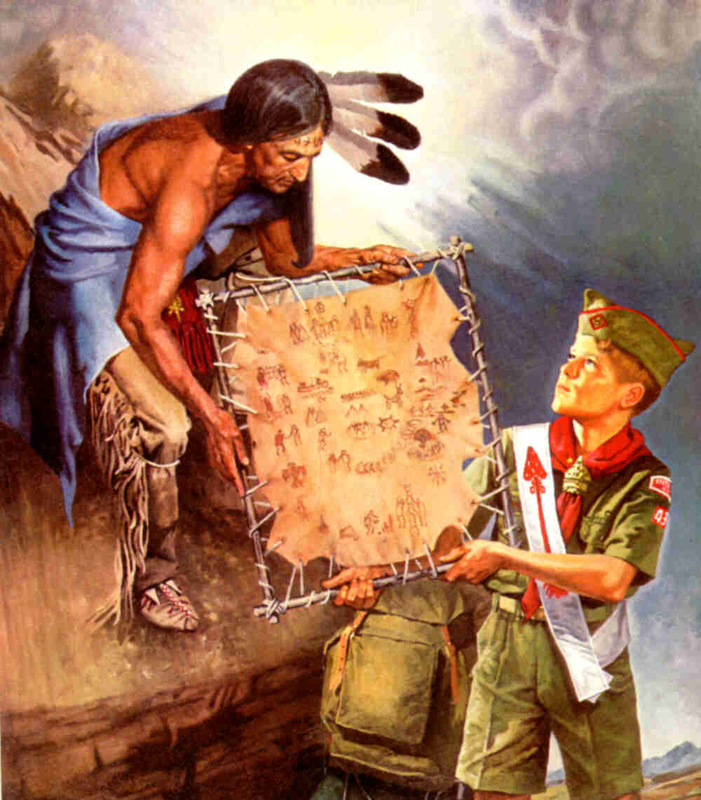 One of the more inspirational paintings related to the Order of the Arrow is a picture of an Indian handing a leather parchment to a Scout who wears an OA sash. It is entitled The Higher Vision and illustrates the idea that Uncas, of OA legend fame, is passing on the legend of the founding of the Order to a Scout. This artwork was re-created in 2000 by the national Order of the Arrow committee as both a bronze and a porcelain figurine. These objects are available for purchase to support a major fund-raising effort by the OA to support expansion of the Seton Memorial Library and Philmont Museum at Philmont Scout Ranch in New Mexico. But where did this art piece originally come from? In 1961, members of Aquehongian Lodge, Greater New York Council, were searching for an appropriate way to memorialize their long term lodge advisor, Lee A. Ellison, who had recently passed away. Ellison was the advisor of Aquehongian Lodge from 1940 to 1957. In addition, he was the Scoutmaster of Troop 43, chartered at that time to the Slosson Post, American Legion. When Ellison passed away, his Vigil Honor brothers thought of many things that they might do to remember his service and dedication to the OA and Scouting. They decided to commission a painting. Upon contacting Martin Mockford, then national secretary of the Order of the Arrow, he recommended Joseph Csatari (a protégé of Norman Rockwell) to paint a picture. A meeting with Csatari was arranged, a theme for the painting was decided upon, and Csatari was commissioned to paint the work. The Indian in the painting is a depiction of Uncas, the son of Chief Chingachgook in both The Last of the Mohicans by James Fenimore Cooper and in OA legend. Uncas is handing down to a Scout the legend of the Order of the Arrow for posterity. The legend itself is something that was developed in Aquehongian Lodge by Ellison. (The original skin along with a skin of the Explanation of the Ordeal hangs in Berlin Lodge at William H. Pouch Scout Camp, a property of the Greater New York Council in Staten Islandborough.) It is the legend of the Order in authentic Lenape pictograghs, which Ellison personally researched. (The “illegal” sash backs often seen are replications of these skins.) It was created on deer skin by Walter Vines. The Scout represents an Order of the Arrow member in Ellison’s Staten Island Troop 43. The Scout is wearing an AquehongianLodge neckerchief with 25th anniversary slide. The painting was presented to the national Order of the Arrow committee in October 1963 at the BSA national office in New Brunswick, N.J. Martin Mockford accepted the painting on behalf of the national committee. Aquehongian Lodge was represented by former lodge chief, Walter Vines; chairman of the Vigil Honor Committee, Martin D. Poller; past lodge chief, John F. Braniff III; and John Novo-Mesky, chairman of the Painting Committee. The painting was paid for by private contributions of Vigil Honor members, not by the lodge.